Windows PC as a FIR Audio Processor: how to? I want to listen to my PC-based music on my Hi-Fi system with the best possible audio quality (of course). No matter the media player or web music channel, every sound should be played. The PC should do all filtering, equalization and phase linearization, avoiding an external DSP. Digital audio will be outputed to a USB port (or sound card), analog converted and amplified. Any modern PC will work starting with Windows NT6 (Vista, 7 or higher). Any USB audio Digital to Analog interface of good quality is suitable (or sound card, be it integrated, internal or external). For my active multiway loudspeaker system, I chose an 8-channel miniDSP U-DAC8. Two software solutions are presented below, a simple and elegant APO setup and a more complex ASIO setup. Both use impulse response files and a convolution engine. Equalizer APO by Jonas Thedering is implemented as an Audio Processing Object for the system effect infrastructure introduced with Windows Vista. Download Equalizer APO and install it. In Configurator, select the audio device to install the APO to. In Sound Control Pannel device Properties, don't disable all Enhancements (although Equalizer APO is not shown). rePhase by Thomas Drugeon is a loudspeaker phase linearization, EQ and filtering tool. Download rePhase and install it in the E-APO config directory, %ProgramFiles%\EqualizerAPO\config by default. 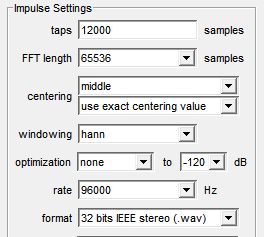 In Impulse Settings, set the sample rate to match the sample rate of the audio device. For a sample rate of 96000 Hz, 12000 taps, precision is 4 Hz (SampleRate/Taps/2) up to 48000 Hz (SampleRate/2). With middle centering, the impulse offset is 6000 samples (Taps/2) which gives a delay of 0.0625 seconds (Taps/SampleRate/2). Save the rePhase .wav generated impulse response files in the E-APO config directory. That's all. If you need or prefer Audio Stream Input/Output, a solution is presented below. Otherwise you're done. Start by creating a root directory, e.g. C:\PrgFiles, and give other users read access. ASIO4ALL by Michael Tippach is a universal ASIO Driver for WDM Audio. Download ASIO4ALL and install it. With Hi-Fi Cable & ASIO Bridge application by Vincent Burel, in regular Pass Through mode all incoming audio on input is going to audio output of the Hi-Fi Cable. Download VB-Audio Hi-Fi Cable and install it. In Sound Control Pannel, set Hi-Fi Cable Input and Output as the default Playback and Recording devices, respectively. Set Advanced Properties of both devices to the same samplerate: 24-bit 96 kHz. Configure Hi-Fi Cable's Input with multichannel if you require it. We'll stick to stereo for now. ConvolverVST by John Pawel is a convolution plug-in for room correction, bass management, cross-overs, equalization etc. Download ConvolverVST and install it in a directory of your choice, e.g. C:\PrgFiles\Convolver. Create a subdirectory, e.g. C:\PrgFiles\Convolver\Data, for the configuration file and impulse responses that you will generate (see below). VSTHost by Hermann Seib will be the host application for the convolution plug-in. Download VSTHost and install it in a directory of your choice, e.g. C:\PrgFiles\VSTHost. In File New PlugIn... open C:\PrgFiles\Convolver\convolverVST.dll. It will be connected between Engine Input and Output. Open the Master Window to access the volume controls. In Devices Wave... select ASIO4ALL Output Port and Sample Rate at 96 kHz. In Devices Asio Control Pannel... Advanced Options, activate your WDM devices. Choose VB-Audio Hi-Fi Cable Input and USB Audio (or sound card) Output. In Devices Asio Channel Selection... select the Stereo Pairs. Select VB-Audio Hi-Fi Cable inputs and USB Audio (or sound card) outputs. In Engine Configure... assign the Input and Output Channels. Assign VB-Audio Hi-Fi Cable inputs and USB Audio (or sound card) outputs. Download this flat 32-bit 96 kHz impulse response file IR_stereo.wav to your convolver data directory, e.g. C:\PrgFiles\Convolver\Data. Edit ConvolverVST plug-in and open IR_stereo.wav in Filter/config. You are ready to test your installation by playing something - but be sure to check the volume first! If you survived all of this then it's time to attack the improvement of your loudspeaker system. Download rePhase and install it in a directory of your choice, e.g. C:\PrgFiles. Save the rePhase generated impulse response files in the Convolver data directory, e.g. C:\PrgFiles\Convolver\Data. For the simplest applications a single sound file can be used as a filter. That's what we did earlier for testing. A Config file allows you to specify more complex filters. Save your config file in the Convolver data directory, e.g. C:\PrgFiles\Convolver\Data. In VSTHost, edit ConvolverVST plug-in and open the Config file in Filter/config. You can find an application for a multiway stereo loudspeaker system here: JdM12 Audio Project 2018. Many thanks to the great people who made their software available freely. If you like any of the software, some authors accept donations.